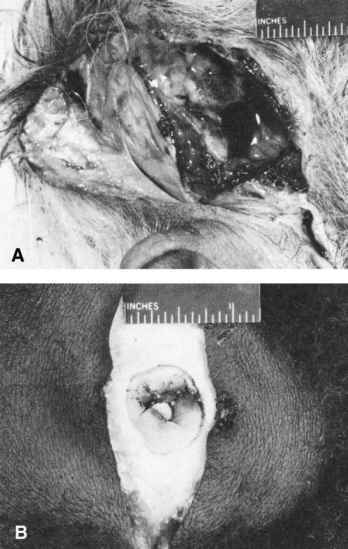 Figure 6.4 (A) Contact wound of right temple with Remington .22 shot cartridge. Incised wound revealing soot deposited on outer table of bone. (B) Distant gunshot wound of head from .22 shot cartridge. Wound incised revealing depressed fracture. cartridge, is used. The cartridge case, which is nickel-plated, is approximately 1/10 in. longer than the standard .22 Long Rifle case. The overall length of the Stinger® and the regular .22 Long Rifle cartridge are the same, however. 1978, was loaded with a 29-gr. hollow-point bullet. Muzzle velocity was 1680 ft/sec from a 24-in. barrel. The cartridge case was nickel-plated and was somewhat longer than the .22 Long Rifle case. This cartridge could be fired in any weapon chambered for the .22 Long Rifle cartridge, except those with match chambers. Pressure limits were within those intended for the .22 Long Rifle ammunition. This cartridge was discontinued in 1982. In 1979, Remington introduced their Yellow Jacket® ammunition. This is a high-velocity .22 Long Rifle cartridge with a 33-gr truncated cone hollow-point bullet having a "gold coat" (copper zinc). The muzzle velocity in a .22 rifle with a 24-in. barrel is 1500 ft/sec compared with 1200 ft/sec for the Remington .22 Long Rifle, 40 gr., high-velocity round. Muzzle velocity in a Ruger automatic pistol with a 4 3/4-in. barrel is 1269 ft/sec compared to a muzzle velocity of 1048 ft/sec for an ordinary 40-gr. high-velocity, .22 LR cartridge. Unlike the CCI Stinger® and the Winchester Expediter®, the cartridge case length is the standard Long Rifle length. Imprinted on the base of the cartridge case is an outline of a yellow jacket. A solid bullet version of the Yellow Jacket called the Viper® appeared in 1982. The bullet weighs 36 gr. and has a muzzle velocity of 1410 ft/sec in a rifle. Federal introduced their high-velocity .22 Long Rifle cartridge, the Spitfire®, in January 1983. This round is loaded with a 33-gr. lead hollow-point bullet or a 36 solid lead bullet. Muzzle velocity is 1506 ft/sec and 1410 in a rifle with a 24-in. barrel. With handguns, muzzle velocity is 1173 ft/sec in a 4-in. barrel for the "Spitfire." This cartridge is no longer manufactured. BB caps are imported from Europe and consist of a case shorter than the Short case loaded with a lightweight lead bullet. The propellant is just the primer. BB caps are not manufactured in this country. CCI, Remington, and Winchester produce CB cartridges. While Winchester produces only the .22 Short version, CCI and Remington produce both .22 Short and Long versions. The CCI and Winchester cartridges are loaded with 29-gr. Short bullets; the Remington with 30 gr. bullets. Reduced powder charges are used so that the muzzle velocity is approximately 706 ft/sec for both the Short and Long CB cartridges compared to 865 ft/sec for the standard velocity Short cartridge (in a 6-in. barreled weapon). .22 Frangible bullets were designed for use in shooting galleries and for stunning cattle for slaughter. The bullets consist of bonded fragments of iron or lead that disintegrate on striking a hard surface. Bullets composed of powdered iron show a slightly greater degree of fragmentation. Although frangible bullets break up on striking a hard surface, such bullets readily penetrate the human body and have caused a number of deaths.4 These bullets are of considerable forensic significance; when recovered from the body, they are unsuitable for ballistic comparison because of erosion of the bullet's surface. Both types of bullets show a fine particulate disintegration of the surface. At most, faint rifling marks unsuitable for ballistic comparison can be seen. The surface disintegration is due to the bonded fragment construction of the missile. In a body, the iron bullets tend to break up into short cylinders or thick disks. 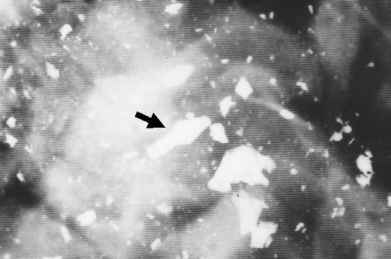 An x-ray film of such a bullet in the body may be very characteristic. The iron gallery rounds can be identified easily by means of a magnet. Iron and lead frangible rimfire cartridges are no longer manufactured.